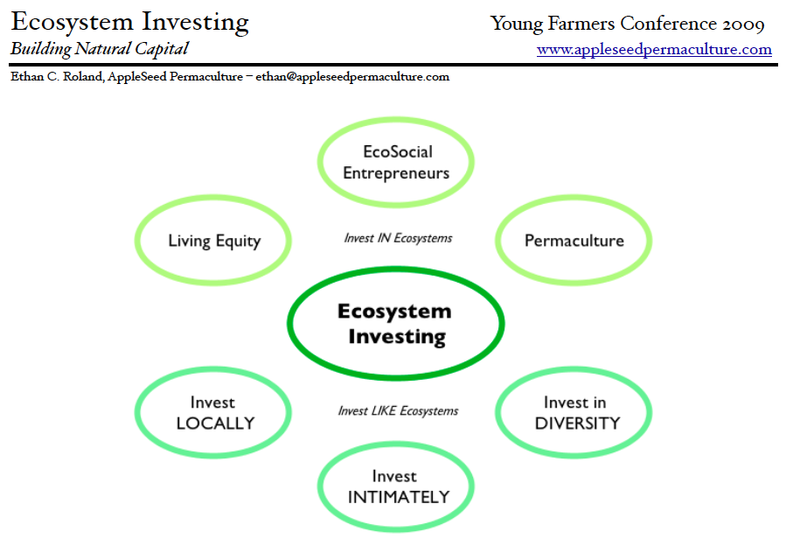 In a Nutshell – A three-month internship with AppleSeed Permaculture, a cutting edge regenerative design firm based in the mid-Hudson River Valley of New York, USA. Internship runs from September 1st to November 20th, 2013 and focuses on professional permaculture design and social entrepreneurship. The internship offers full immersion and guided mentoring for everything from computer-aided drafting to deep nature connection. This is a unique opportunity – there’s nothing else like it, period. 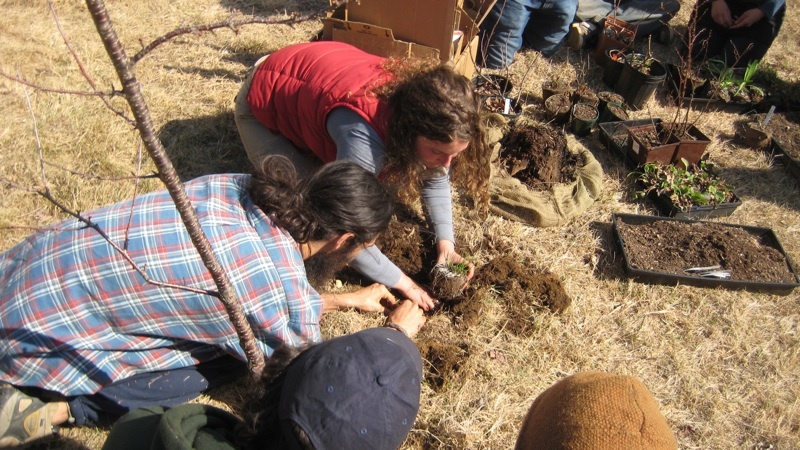 Interns must be permaculture-trained, hard-working, and self-directed. Three internship positions are available. Application period June 1st – July 15th, 2013. To apply for the Internship, download the application by clicking here and return it to design@appleseedpermaculture.com by July 15th, 2013. “This internship was a launching pad for me to dive into doing work I am passionate about for a right livelihood – it empowered me with practical skills and deeper understandings to effectively accomplish my goals.” – Brandy Hall, 2010 Intern, owner of Shades of Green, Inc.
Who – Self-directed, entrepreneurial, motivated permaculture designers committed to creating positive change through social enterprise. Must have completed a Permaculture Design Certification Course. Computer skills and mac laptop with Adobe Creative Suite and are necessary. Preference given to applicants who identify as people of color, native peoples, and women. What – Action learning internship with AppleSeed Permaculture, a cutting edge regenerative design firm combining disciplines of sustainability to integrate humans into the landscape by designing productive ecosystems for homes, businesses, and communities. Internships are a mix of research and hands-on project-based learning. Manage a professional design project for a real AppleSeed Permaculture client. Learn from AppleSeed Staff Designers by working with them on their projects: Large-scale water systems, urban edible landscapes, residential micro-farms. Engage with proprietary systems for running an efficient and sucessful design business. Absorb and emulate the processes of your local ecosystems to deepen your skill as a integrative designer. Research and apply the best practices of permaculture, biomimicry and eco-social design. Where – The internship will take place in the Hudson River Valley bioregion of the northeastern United States. The AppleSeed Permaculture office is in Accord, NY. Interns will have the opportunity to live and work on a local permaculture farm for the duration of the internship. Tama Jackson – Designer, Project Manager & Soil Specialist. Dyami Nason-Regan – Lead Designer, Edible Landscaping & Installation Manager. Ethan Roland – Lead Designer, Financial Permaculture & Agricultural Economics Specialist. When – September 1st – November 20th, 2013. Why – The Permaculture Design Course is a great introduction to permaculture. And, the world needs professional permaculture designers to actually create effective change. 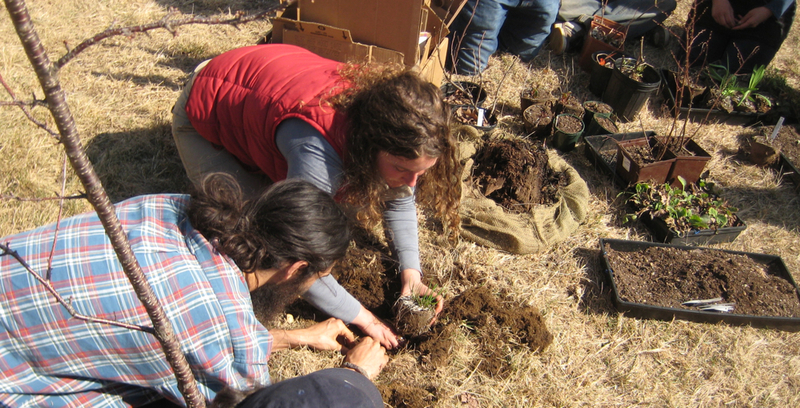 Becoming a professional permaculture designer requires a large and diverse skill-set, training in social entrepreneurship, and hands-on mentoring from working professionals. If you are someone who wants to become a professional permaculture designer by working with seasoned experts in the field, this internship is for you. To Apply – Download the application by clicking here. Return the completed application and all attachments to design@appleseedpermaculture.com by July 15th, 2013. In a Nutshell – Two to three-month internships with AppleSeed Permaculture, a cutting edge regenerative design firm in the mid-Hudson River Valley of New York. Internships run 2 days per week from May 15th to August 15th, and focus on professional permaculture design and eco-social entrepreneurship. The internship offers full immersion and guided mentoring for everything from computer-aided drafting to financial permaculture accounting. This is a unique opportunity – there’s nothing else like it, period. Interns must be self-directed and self-sufficient, organize their own accommodations, and provide their own transportation. Two internships are available, at the cost of $2,000 per intern per month. Application period March 15th – April 1st, 2011. Please submit a letter of introduction with your personal & professional goals, a 1-2 page resume, and 3 references to design@appleseedpermaculture.com. See below for full details. NOTE (March 28th): SCHOLARSHIPS NOW AVAILABLE! 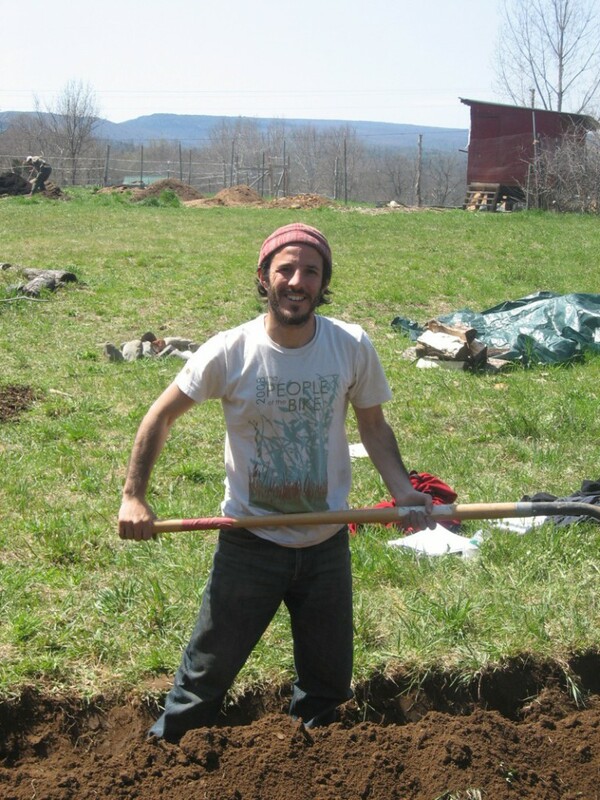 AppleSeed Permaculture is extending needs-based scholarships to outstanding internship applicants. In your application, please indicate the amount of money you are able to contribute per month for this unique internship experience. “This internship was a launching pad for me to dive into doing work I am passionate about for a right livelihood – it empowered me with practical skills and deeper understandings to effectively accomplish my goals.” – Brandy Hall, 2010 Intern, Ashevillage Institute & owner of Shades of Green, Inc.
Who – Self-directed, motivated permaculture designers committed to creating positive ecological and social change in the world. Must have completed a Permaculture Design Certification Course. Computer skills and mac with Adobe Creative Suite are necessary. Preference given to applicants who identify as people of color, native peoples, women, and other constituencies targeted by oppression. What – Action learning internship with AppleSeed Permaculture, a cutting edge regenerative design firm combining disciplines of sustainability to integrate humans into the landscape by designing productive ecosystems for homes, businesses, and communities. Internships are a mix of research and hands-on project-based learning. Interns will learn about all aspects of running a small business while collaborating with professionals in the fields of education, international aid and development, architecture, design, and engineering. Skills learned include über-clear communication, high tech digital design, low-tech field methodology, edible landscape establishment & caretaking, and integral design systems (holistic management, spiral dynamics, eight shields, financial permaculture, and others). The program is flexible, seeking to achieve the learning goals of the intern while meeting the needs of the firm. Interns may apply for one internship session of two to three months within the May 15th to August 15th window. The primary project areas of the internship are Permaculture Design and Eco-Social Entrepreneurship. • Permaculture Design – Communities require local food security to thrive in the coming years. The intern helps build community through integrative farm & agriculture research. For example, current clients include a green co-housing development, two production orchards transitioning to permaculture, and diversified organic farms from New York City to Vermont. 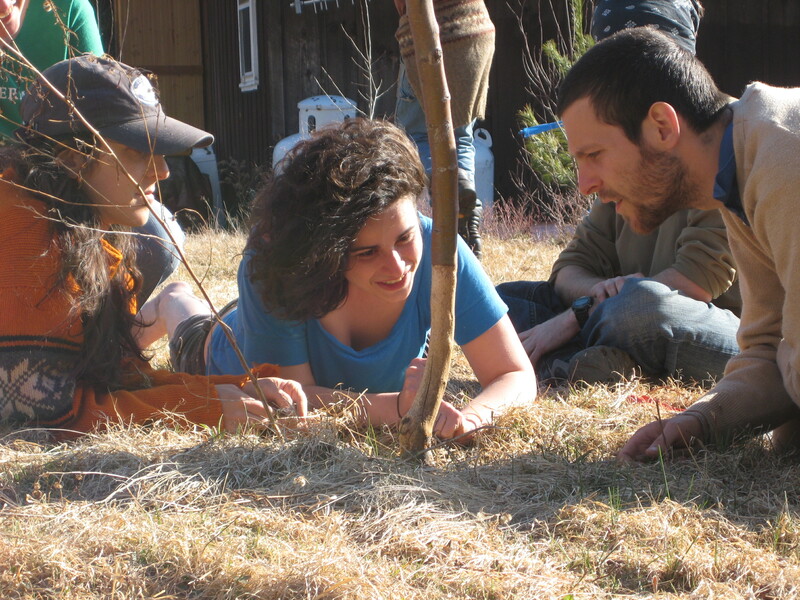 To get a sense of the work you’ll learn to do, check out the AppleSeed Permaculture Portfolio. • Eco-Social Entrepreneurship – Tackle the most complicated issues faced by humanity through innovative enterprises that regenerate ecological and social health. Learn skills for inter- and intra-personal communication, legal and financial business start-up and development, whole-systems marketing, open collaboration enterprise models, and action documentation of ecological, economic, and social solutions to global climate change & peak oil. Interns gain hands-on experience with ecosystemic business management, focusing on collaboration, web 2.0 tools, and social media networking. Where – The internship will take place in the Hudson River Valley bioregion of the northeastern United States. The AppleSeed Permaculture office is in Stone Ridge, NY. Interns will have the opportunity to live and work on a local permaculture farm for the duration of the internship. When – Monday & Wednesday, 9:00am – 5:00pm for two-three months, May 15th to August 15th. Application period March 15th – April 1st, 2011. Internships will be awarded on April 15th, 2011. Why – In working towards sustainability, you must seek leverage points for positive change that work fast and impact large numbers of people. This is a unique opportunity – the internship trains you in systems-thinking, preparing and empowering you for real world action. How – A mixture of self-directed and collaborative project work. Direct mentoring empowers intern to take on and lead their own projects. Your Next Steps – If you are interested in an internship position, Please submit a letter of introduction with your personal & professional goals, a 1-2 page resume, and 3 references to design@appleseedpermaculture.com before April 1st, 2011. 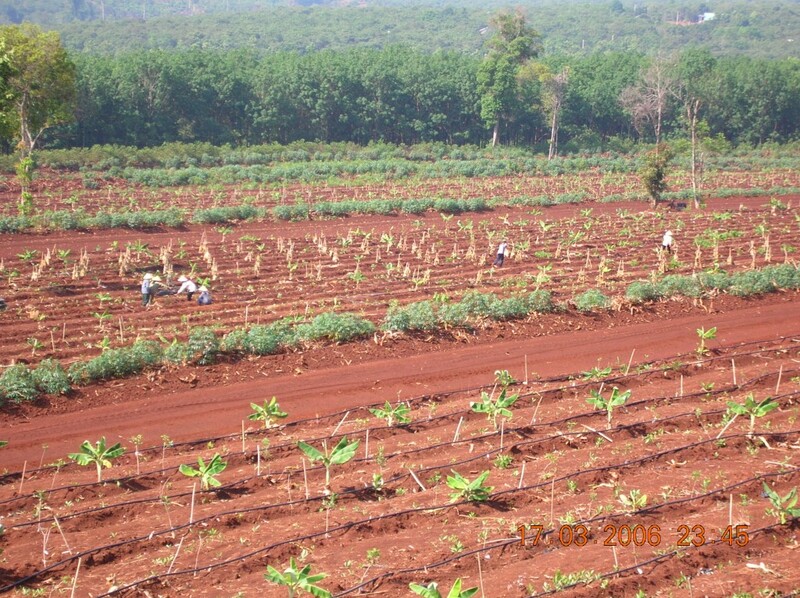 Can Agriculture Regenerate Damaged Land? 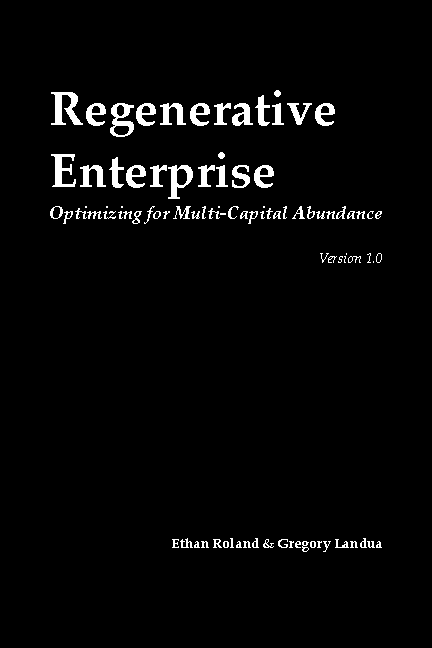 I am seeking actual examples of properties where regenerative agricultural practices have restored damaged land and increased their property values. Specifically, projects that used permaculture, holistic management / planned grazing, organics/biodynamics, soil foodweb / biofertile soils, and other regenerative agricultural practices. I want to find examples to support the growth and acceptance of these tools as potential means to create resilient, just, and sustainable human communities on the planet. To see some examples, keep reading below the fold. Are you looking for a permaculture designer to transform your home, business, or institution into a thriving oasis of sustainability? I’ve assembled an initial list of all the permaculture design firms in the world (that I could quickly and easily find online). 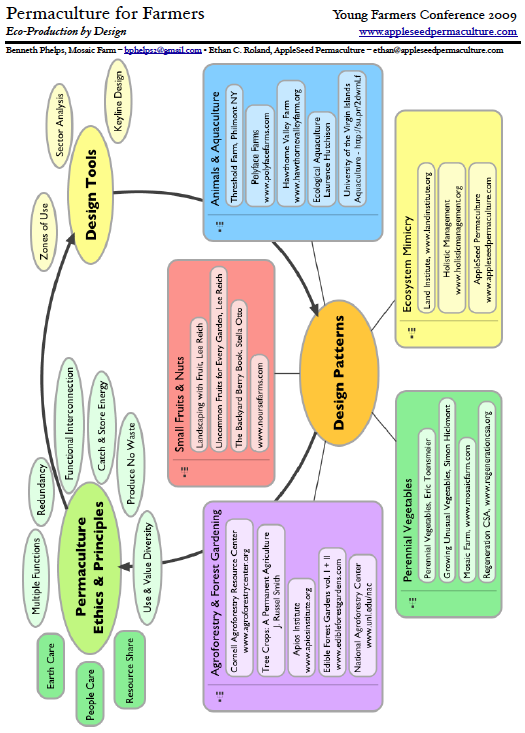 The graphic was created using VUE Mindmapping software. I’ve compiled these from one hours worth of research, so if you know of any firms missing from this list, please add your business name and website link in the comments! 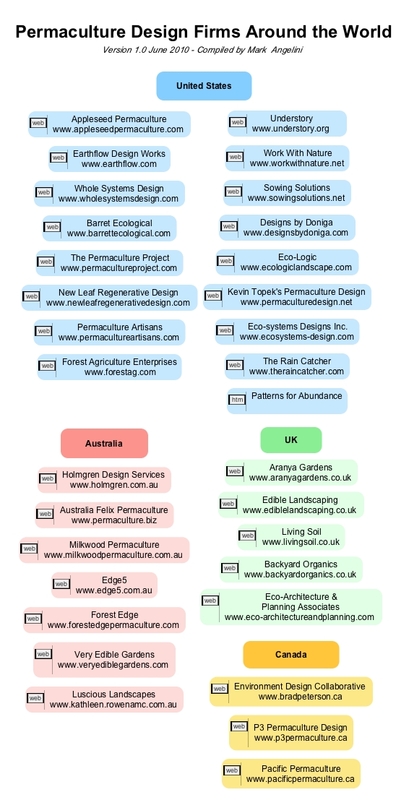 Don’t see your permaculture design firm listed? Add the name and website link in the comments! Below are the slideshows and handouts for the two workshops I presented last week at the Young Farmers Conference, dosage held at the incredible Stone Barns Center for Food and Agriculture. Let me know what you think in the comments – and Enjoy! Download the handout by clicking on the image below.